Hi Guys, Diablo emailed me this morning to announce that they've got their tuner units ready for the 2014's, here are some of the options it does, I've had a Diablo for my 2010 Denali since I purchased it, but back then there were a lot fewer things supported than they appear to be doing now (primarily purchased it to change the tire sizes and disable the limiter) inTune really improves the 2014 GM Truck; tunes included are 87 octane tune, MPG Booster Tune, and the Diablo tune, which should be used with octane higher than 91. Increases of up to 15 hp and 20 ft lbs of torque can be seen across the entire RPM range with the Diablo Tune. Our tunes are calibrated specifically to improve performance, drivability, and economy and reduce the factory's power-robbing "torque management" to put more power to the ground when you need it. Other options include TCM (Transmission Control Module) control to adjust automatic shift characteristics, DOD (Active Fuel Management) disable, speedometer adjustment for gear and tire changes, and raising speed and rev limiters. Hi all, 1500 high country 20 inch chrome rims peeling around valve stem. 3 out of 4 are doing that. 20,000 kms on truck. GM said they would cover only 2 of them... Saw on forum that a guy w a GMC truck got all 4 replaced... Your thoughts? Truck was purchased new in November 2014. It's the 5.3L, with 3.42 gears. SLT crew cab short box 4x4 model. I added the G4 Elite Fold-A-Cover week 1. Hey guys, I posted in the giant thread about my fix but I'm sure it's already gotten lost. I think this is important to at least have floating somewhere for someone to search. Symptoms: At 60-70mph I was experiencing a severe shake/vibration. I could usually push out of it at 70+ but it was still noticeable. It was like clock work as soon as I hit up around 60mph. Solution: I got my truck fully inspected before purchase and they noted the vibration. Mechanic showed me a dent in the drive shaft and general wear on the shaft. His recommendation was to replace it. I ordered the part online. The new shaft came fully assembled with new Ujoints and the yoke to slide in. Installation was very easy. I have driven 100 miles since installation and I have ZERO vibration. I hit 60mph and it is very smooth. So the culprit could be the shaft the ujoint or the yoke. Once again this fix worked for me and it may not be the same issue on your truck but I had pretty bad vibrations and they are GONE. Good luck!! *NOTE* I have no warranty so that is why I attempted a fix on my own. I'm sure this problem will still crop up as peoples warranty starts to expire. Hey everyone, got a question someone might be able to answer. I've got a '14 Silverado 1500 WT. At the back under the bed on the driver side near the spare tire is a wire hanging down with no end. Originally thought it was a frame ground because the outer casing is black but today I took a pair of wire stripers and found that there are 3 thin wires inside of the black sheathing. They are Solid Red, Solid Yellow, and Solid Black. All lights on the truck work, the trailer lights all work when plugged in too. Anyone have any idea what this could go to? I currently have it rolled up and ziptied to the frame. Thanks for any help. I am having problems with my air conditioning again. My A/C is blowing warm air and this is the second time I have had this problem since buying my 2015 Sierra less than 6 months ago. A few months ago I had the exact same problem and my dealership diagnosed it as a leaking hose and all of the freon was gone. They had to order a new hose and it took a week for it to come in. They installed the new hose and added more freon and it has been fine for the past 3 months until today. This morning I noticed that the air coming out was warmer than normal even though I have the A/C set at 65 degrees. It was fine yesterday. I am going to monitor it and see if it gets worse and if so make an appointment to take it to the dealer again. Just wondering if anyone else has had to replace the hose or had a freon issue with their 2014 or 2015 Sierra / Silverado? Hey Forum, Regarding the oil drain plug on the 2014 5.3L, is anyone using aftermarket magnetic plugs? What about a magnetic oil filter sleeve, or both? Just curious because last weekend I changed the fluid in my front & rear differentials, and transfer case - all of which have magnetic plugs on them. However, none of of them have filters so, I assume adding a magnetic drain plug or filter sleeve would not make much difference since that is what the oil filter is for. Again, just curious to see everyone's thoughts! Bought a 2017 Chervrolet Silverado crew cab 4wd Lt from Gateway Chevrolet in Avondale, Arizona. It only had 2800 miles when I bought it, certified preowned. This was back in November 2017, few months ago I realized the truck had about a dozen dime sized dents throughout the roof, very slight dents but definitely there. It infuriates me how they didn't disclose this to me, I bought the truck for an unreasonably expensive price considering it had dents on the roof. It angers me because The truck cost me 38,000 dollars and they didn't disclose dents on the roof, body damage!!! it will cost me nearly a thousand dollars to repair. I called Chevrolet and of course there is nothing they will do about it. I called the dealership and I haven't even been able to get through to a person in charge, they keep on giving me the run around. 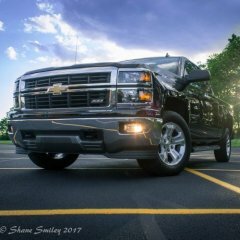 I am so pissed, I can't believe Chevrolet did this to me, I feel lied to I decided to buy Chevrolet because of the reputation it has but am now wishing I would have bought a ford instead.